Can the FasciaBlaster Help With Fibromyalgia Pain? If you spend any time on Facebook, you might have heard of the FasciaBlaster. It is a rigid plastic tool used to vigorously massage tissue “like scrubbing on a washboard” with the aim of reducing the appearance of cellulite. Some also report that it helps with their chronic pain related to arthritis and fibromyalgia. The theory behind using a rigid tool like the FasciaBlaster to treat cellulite is that it can physically disrupt or break up some of the connective tissue webbing that separates our fat tissue into uneven blobs that we call cellulite, thus giving a more smooth appearance. While no scientific studies have been done, there is an army of vocal fans on social media proclaiming its benefits for cellulite reduction. I am all for something that can reduce cellulite. But if you have fibromyalgia and decide to try it, make sure to start slowly and see how you respond. Several of my patients who’ve tried it gave themselves really swollen, painful, and bruised thighs. Thanks to the massive social media and press presence of the FasciaBlaster, many more people are now familiar with the term “fascia.” This is huge progress, because the important role of fascia in the body has long been overlooked, even by doctors. 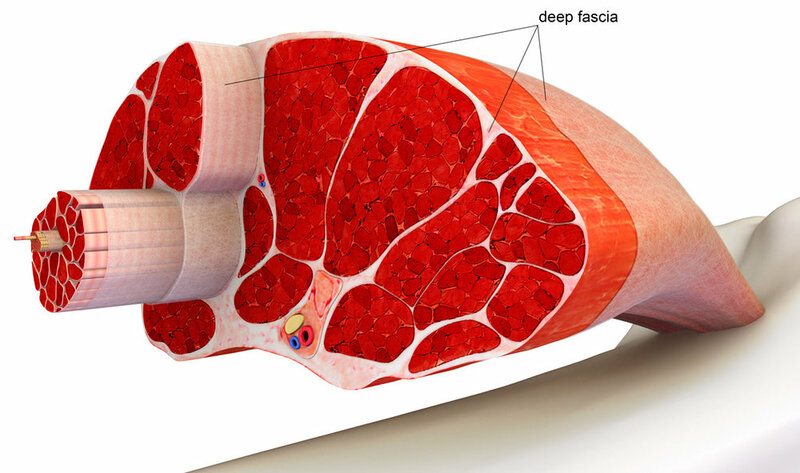 Diagram of a muscle with fascia (the white sheaths) wrapping each concentric layer, from the individual cell up to its attachment to the bone (click to enlarge). Many research studies have shown that many different types techniques to break up the painful scar tissue and knots in the fascia around the muscle can potentially reduce pain. Rubbing muscles and tendons with a rigid tool like the FasciaBlaster, if used correctly, can have this same effect. But the technique here is important, and if used incorrectly with too much pressure the FasciaBlaster can create more scar tissue and worsen pain. (I guarantee I will get some hate mail for that statement! Please, FasciaBlaster fans: If it works for you, that is great.) To give a frame of reference, physical therapists using rigid metal tools to treat the muscles have to undergo many hours of additional training to be certified in what is called the Graston Technique, to ensure they can do it correctly. For patients with chronic pain, especially fibromyalgia, even with a certified physical therapist applying the technique correctly, the rigid tools used in Graston Technique can be intolerably painful. My biggest concern with the FasciaBlaster is that it is so unforgiving and rigid that patients can easily hurt themselves, and if used in the wrong ways can cause harm instead of helping. There are more effective and gentle methods to get the same or more benefit, and my favorite is a specific form of manual therapy called myofascial release. This technique, as taught by renowned physical therapist John F. Barnes, involves a combination of sustained manual traction and prolonged gentle stretching to break up the scar tissue and adhesions in the fascia. It is by the far the most effective treatment I have found to reduce fibromyalgia pain. Two large European studies found that after 20 sessions of myofascial release, fibromyalgia subjects reported significant pain reduction. What is really great, though, is that they also showed long-lasting pain relief, still reporting reduced pain levels one month after their last session. It is also easy to learn how to do myofascial release stretching yourself. The simplest way is to place a small, soft ball under any tight and painful areas of muscle. Allow yourself to sink onto the ball for a few minutes to provide the right amount of sustained pressure to allow the fascia to release. This prolonged gentle stretching and sustained pressure has been shown to break up painful adhesions in the fascia. You can learn more about different self-treatment tools that I recommend here. Of course, I support the use of any self-treatment tool that works for people with pain, and if the FasciaBlaster helps some people I am all for it. But from my experience, it is too intense for most fibromyalgia patients and requires really good technique to get benefits and not harm. I am, however, very grateful to Ashley Black, creator of the FasciaBlaster, for bringing the term fascia into popular conversation and social media. To find a myofascial release therapist in your area, visit mfrtherapists.com. Learn how to give do self-myofascial release with this Myofascial Self Care Video Course or in the book Comprehensive Myofascial Self Treatment.